The house is situated in Grape Lane on the harbour side. A plaque on the wall states that the house was built in 1688 by Moses and Susannah Dring. It is a largish building on three floors with an attic. It is regarded as a typical example of a well-to-do ship-owner's house of the period. Much is known about the furnishings of the house from an inventory of contents taken in 1754. The two ground floor rooms are furnished according to this inventory and decorated in the original colour. The property was bought in 1729 by the father of Captain John Walker, and became his home and place of business. He was also a captain in the merchant marine and developed the family's shipping business. He died in 1743, and in his will (Borthwick Institute, York), divided his ships between his sons John and Henry, but left the house to them as tenants in common. The brothers allowed their mother to continue to live in the house. After the deaths of his mother and brother, John Walker moved into the house by 1755. The house remained in the family until the mid 19th century and then was used by turns as a hospital and as a private residence until rescued in 1986 to become the Captain Cook Memorial Museum. Cook was introduced in 1746 to Captain John Walker by William Sanderson, the grocer for whom Cook had worked in Staithes, a nearby fishing village. Walker took him on as apprentice seaman for a three-year term. Cook served Walker first as apprentice, then as seaman and lastly as master's mate until he joined the Royal Navy in 1755. He spent most of his time at sea on Walker's colliers, mainly in the coal trade between the Tyne and London but including voyages to the Baltic and Dublin. The Whitby historian George Young, ‘Life of Cook’ 1836, stated that during Cook's apprenticeship Walker retained Cook in Whitby on occasion and lodged him in the attic of the house in Grape Lane. There should be no difficulty in accepting this account even though Walker lived elsewhere at the time. Apprentices’ indentures of 1735 and 1758 (held in the Museum) show that shipowners tended to avoid obligation to lodge apprentices in their homes, preferring to release them during the winter months to go home to their families in Whitby and the surrounding countryside. If an apprentice was retained ashore, he would either be boarded in the town, or anywhere convenient such as the house in Grape Lane where there was space. Young also described Cook studying in the attic with the aid of candles provided by Mary Prowd, a family servant. Like any ambitious apprentice, Cook would have studied algebra, geometry, trigonometry and navigation, probably with the help of schoolmasters paid for by the ship owners. The house was also the scene of Cook's only known visit to the town after 1755. This was in the winter of 1771–72. Cook was staying in Great Ayton, and ‘took horse’ to visit his old master in Whitby. When Cook arrived, the household was lined up to greet him, and told to behave well. The elderly housekeeper, Mary Prowd, who had befriended Cook a quarter century before, could not restrain herself. Flinging her arms round the great man, she cried "Oh honey James! How glad I is to see thee!" A brick floor in a herring-bone pattern lying next to the house about a metre below today's ground level. A ‘brick-floored room’ a kitchen by its contents, was referred to in the inventory of 1754, but its location was unknown until now. A slipway, leading down from the main building to the river, with deposits above it dating from the mid-late 18th century. The courtyard, a metre or so above the slipway was built over it as the Walker family moved out of ship-owning into banking and insurance. The acquisition of Walker's House by the Cook Museum Trust enabled the Trust to establish a museum in Whitby dedicated to the celebration of the life of Captain Cook and the scientists, artists and crews who sailed with him. The collections comprise original letters about the Voyages including correspondence of Cook, Lord Sandwich, Sir Joseph Banks and the Forsters, paintings and drawings by the artists who went with Cook to the Pacific, including Parkinson, Hodges, and Webber, artefacts from the Pacific islands and New Zealand, original maps and charts, and ship models. In 2009 a local newspaper reported that Matavai Bay Otaheite, a painting by William Hodges from the 1770s, was bought by the museum with help from several charities and trusts including The Art Fund. The painting depicts Matavai Bay, Tahiti which Cook visited on his second voyage. Welcome to Yorkshire (formally the Yorkshire Tourist Board) gave the museum a White Rose Award in 2005 and 2012 and it was a winner of a VisitEngland Gold Award for Excellence in 2013. ^ "Services in the Whitby area" (PDF). Arriva. Retrieved 7 September 2016. ^ "840 Leeds - York - Pickering - Whitby". Transdev. Retrieved 7 September 2016. ^ Historic England. "Captain Cooks House (1148246)". National Heritage List for England. Retrieved 24 June 2016. ^ a b Young, George (1817). A History of Whitby, and Streoneshalh Abbey: With a Statistical Survey of the Vicinity to the Distance of Twenty-five Miles, Volume 2. Whitby, England: Clark and Medd. p. 851. OCLC 2773643. Retrieved 7 September 2016. ^ Kippis, Andrew (1788). The Life of Captain James Cook, Volume 1. G. Nicol, and G. G. J. and J. Robinson. pp. 2–4. OCLC 2356127. Retrieved 7 September 2016. ^ a b Young, George (1836). The life and voyagers of Captain James Cook. London: Whittaker, Treacher & Co. p. 7. OCLC 7140522. Retrieved 7 September 2016. ^ Beaglehole, John Cawte (1974). 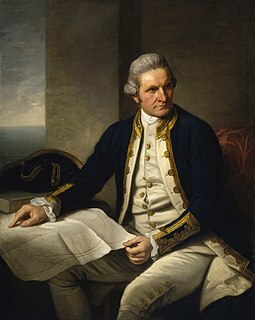 The Life of Captain James Cook. Wellington: A & C Black Publishers Ltd. p. 284. ISBN 9780713613827. Retrieved 7 September 2016. ^ "Rare painting of Captain Cook voyage at museum". Whitby Gazette. 3 June 2009. Retrieved 24 June 2016. ^ "Exhibit: Captain Cook's crew tested in 'extreme' antarctica". Whitby Gazette. 28 May 2016. Retrieved 24 June 2016. Staff at the Captain Cook Memorial Museum in Whitby, North Yorkshire, England (2015). Wikimedia Commons has media related to Captain Cook Memorial Museum, Whitby. George Hyde Chambers was an English marine painter. York Art Gallery in York, England is a public art gallery with a collection of paintings from 14th-century to contemporary, prints, watercolours, drawings, and ceramics. It closed for major redevelopment in 2013, reopening in summer of 2015. It is managed by York Museums Trust. Duff was a ship launched on the Thames in 1794. In 1796 the London Missionary Society engaged her to take a party of missionaries to the South Pacific. Once she had landed the missionaries she sailed to China and took a cargo back to England for the British East India Company. On this voyage her captain named a variety of South Pacific islands. On her second voyage to deliver missionaries a French privateer captured her off the coast of Brazil on the outward-bound leg of her voyage. Whitby Lifeboat Station is a Royal National Lifeboat Institution RNLI lifeboat station located in Whitby, North Yorkshire, England. It is one of nine situated along the Yorkshire coast and is home to both an All-Weather Lifeboat (ALB) and an Inshore Lifeboat (ILB). A lifeboat station has been in existence in Whitby since 1802, with responsibility for the lifeboats being part of the RNLI since 1861. In its 200 plus year history, Whitby has had five different lifeboat stations. A sixth lifeboat and station was located at Upgang, just up the coast from Whitby, and whilst it was considered separate from Whitby, it was crewed by men from the Whitby lifeboat.